Being physically active is not enough, having a balanced diet is the other main factor in reducing NCDs. We know that regular physical activity and a balanced diet are the only ways to fight obesity and certain types of diabetes. Obesity and diabetes kill too many in our region and it’s time to take action. 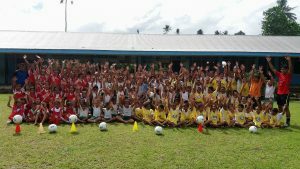 Today kicked off first festival for designated schools in Sagaga, Aana 1 and 2, Falealili and Safata districts to celebrate Health and Wellness throughout the week. One of Just Play Programme’s objectives is to increase healthier lifestyle choices and to reduce the risks factors associated with Non Communicable Diseases. Teachers and coaches will utilize the key messages facilitated in the activities for the children in the past four weeks to verify the importance of these key messages such as 5+ a day, water is good, make healthy choices, eat well! stay well. In additional they will offer tips to children such as considering fruits and vegetables as your source for Youth, rich in vitamins, nutrients, antioxidants, fibre and water, fruits and vegetables are important nutrients for the body, eating fruits and vegetables reduces your chances of developing chronic diseases such as diabetes, high blood pressure and heart disease and eat 3 meals a day (Breakfast + Lunch + Dinner) and the Benefits of Water. 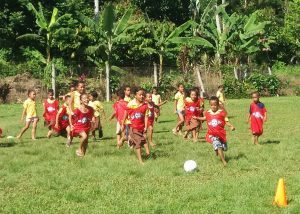 Just Play team will continue provide support through monitoring and evaluation for these schools by helping them change and improve the programme and not only that but to measure the impact of Just Play in schools and communities. 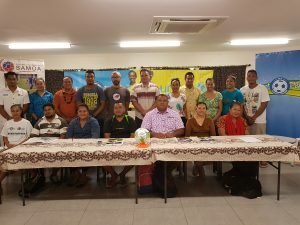 Today’s festival conducted in Leulumoega Primary School of Sagaga districts, Samatau Primary School and Pata Primary School from Aana 2Moamoa/Tauaoo Primary School – Aana 1, Apolima Primary School – Aana 2, districts will kick off on Wednesday, Satuimalufilufi Primary School – Aana 2, Tuanai Primary School – Sagaga, Malie Primary School – Sagaga, Nene Primary School – Falealili districts on Thursday and Vaiee Primary School in Safata districts and Siumu Primary School of Falealili district of Friday. 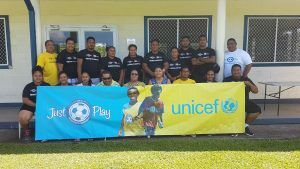 Fruits and Water will be provided for children and participants thanks to our Key Partners the Australian Government, the New Zealand Government, Football Federation Australia, UEFA Foundation for children and UNICEF and managed by the Oceania Football Confederation.